Definition: The Grand Strategies are the corporate level strategies designed to identify the firm’s choice with respect to the direction it follows to accomplish its set objectives. Simply, it involves the decision of choosing the long term plans from the set of available alternatives. The Grand Strategies are also called as Master Strategies or Corporate Strategies. 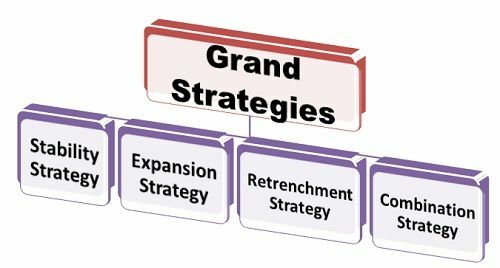 The grand strategies are concerned with the decisions about the allocation and transfer of resources from one business to the other and managing the business portfolio efficiently, such that the overall objective of the organization is achieved. In doing so, a set of alternatives are available to the firm and to decide which one to choose, the grand strategies help to find an answer to it. Business can be defined along three dimensions: customer groups, customer functions and technology alternatives. Customer group comprises of a particular category of people to whom goods and services are offered, and the customer functions mean the particular service that is being offered. And the technology alternatives covers any technological changes made in the operations of the business to improve its efficiency.